Solar energy is a guaranteed investment with returns of 8% – 15% possible. That’s in excess of £20,000 TAX FREE! Energy bills are rising at alarming rates, Solar Photovoltaic panels will help you to manage your energy costs by using the electricity you generate during daylight hours, reducing the amount you buy from your electricity supplier. Your energy supplier will pay you for the electricity you generate, whether you use it all or not, this is known as the Feed-In-Tariff. Reduce your carbon footprint and help keep our natural country green for future generations. Solar panels are green energy that need very little maintenance. Our qualified and knowledgable staff will design a solar PV system that will give you the best possible payback on your investment. 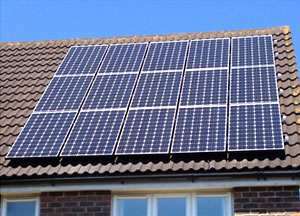 If your home isn’t suitable for solar panels we’d rather not sell them to you, so you can rely on us for honest advice.